A thrilling and startling novel from the author of the international bestseller "The Genesis Secret"
When David Martinez, a young lawyer, receives an ancient map from his dying grandfather, the mysteries of his past begin to open up before him. The map leads David into the heart of the dangerous Basque mountains, where a genetic curse lies buried and a frightening secret about the Western world's past is hidden. Meanwhile, London journalist Simon Quinn may have found his big break. A wealthy, elderly woman has been murdered in the most horrific fashion, and another homicide soon follows. Both victims came from villages in the Basque region, both were interred at a top-secret Nazi camp, both have been silenced for what they know about the experiments conducted on the Basques, the Jews, and a dwindling mystical tribe of pre-Caucasian locals called Cagots. From the North Sea islands to the Arizona desert, from the graveyards of the Basque countryside to the heart of colonial Africa, Martinez's and Quinn's quests intersect to reveal the shocking roots of racial persecution, human violence, and war. "The Genesis Secret"-already in its fourth hardcover printing and appearing on several bestseller lists-immediately established Tom Knox as a searing, brilliant new voice in commercial fiction. 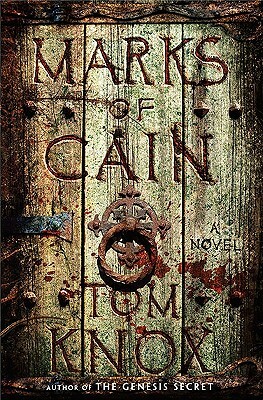 "The Marks of Cain" dares to raise the bar even higher and promises to be an even greater success. Tom Knox is the pseudonym for the journalist and writer Sean Thomas. He lives in London.